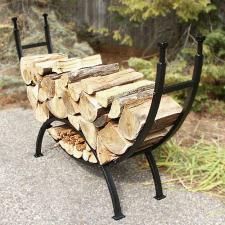 This stylish curved log rack is constructed of durable, 18-ga., 1 1/4" square steel and features a baked-on, polyurethane powder-coated, glossy black finish and is finished on the ends with beautifully designed finials. Holds 1/2 face cord of wood, is 46" high, 12" deep, and 69" long. Weighs 55 lbs. and is easy to assemble. Free Fast Shipping and Guaranteed Price - Now thats Direct.